This photo from the Alyeska Pipeline Service Company shows pump station 5, where flames from a vent prompted the shut down of the Trans-Alaska Pipeline Wednesday, April 20, 2014. The Trans-Alaska Pipeline resumed operations after a fire at a pumping station forced officials to shut it down on Wednesday, according to the company running the system, NBC News reported. 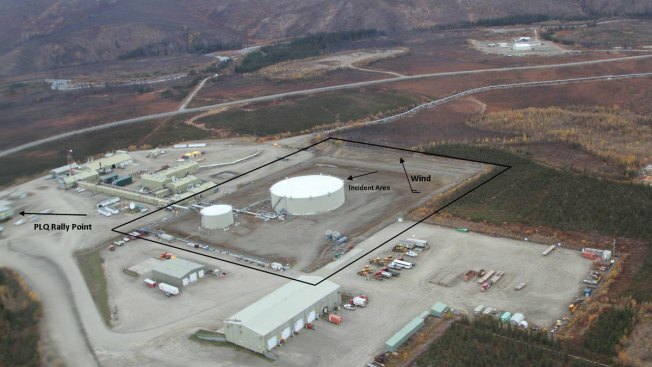 An employee noticed the flames at the pipeline’s pump station in the Coldfoot area near the Arctic Circle and the pipeline was shut down, Alyeska Pipeline Service Company said. The pipeline was restarted at a reduced rate of about 400,000 barrels a day. The company said it was returning the pipeline to full operation. No injuries were reported. The pipeline transports 545,000 barrels of oil — or just under 23 million gallons — a day.